The Westwood Council on Aging hosted their annual Holiday Luncheon this past Wednesday at the NorFolk Golf Club. 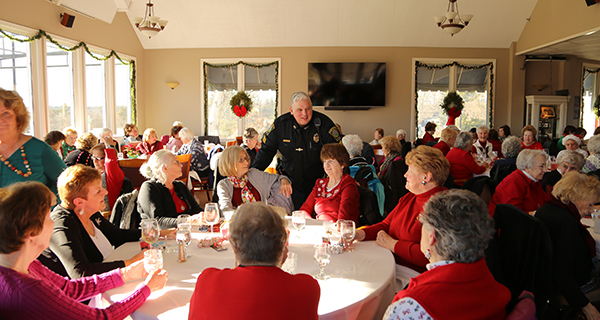 With light streaming in off the fairways and across the packed dining room, 135 senior members of the Westwood community, town representatives, the police department and the North Pole enjoyed a lunch buffet, live harp music, a raffle sponsored by COA supporters, and each other’s company on the sunny afternoon. This was the first year the event was held at the NorFolk Golf Club. After selling out in five minutes last year, COA board member and former NorFolk Golf Club president Bill Sebet asked the Club to donate their space for the event. With the new space, attendance doubled from last year, selling out in ten minutes this time around. “This has worked out good, except its looking like it’s going to be too small for next year!” Sebet said with a laugh. Gift baskets stuffed with groceries, gift cards, cash and scratch tickets were donated by local businesses and raffled off throughout the lunch.